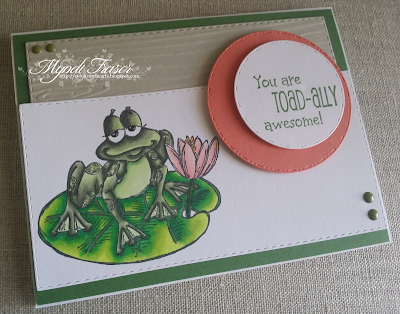 It's Team #1's Sweet Sunday at the Rubbernecker Stamps blog, and today I have a card that I made using "Toad-ally" and "Frog on Lily Pad". I made it as a birthday card for my nephew, and sent it to him before I remembered that I'm supposed to send my Rubbernecker cards to the home office in California for them to use in the scrapbook shows where they showcase our cards!! So I guess I'll have to make another one for them. lol! I coloured the image with Copics. Most of my paper is from Stampin' Up, except for the white. The enamel dots are also from SU; the stitched circle die cuts are from By DIEzyne which you can't buy anymore. Today is new release day at The East Wind, and the last one for April. (The freebie for May is just around the corner so make sure you are signed up for the newsletter!) Today's new release is an Aurora image "Bath". I coloured the image with Copics. My DP is all from Stampin' Up. The sentiment is from Kraftin' Kimmie Stamps "Betsy Booklover" stamp set. On May 1 we will have a new challenge up on the challenge blog. Make sure you pop over there to check it out or head to the Facebook group. We'll have details there too! Plus I will be back here with some DT inspiration for you!! If you aren't already following me, check out the links to the right➡ and follow me on social media. Hello! 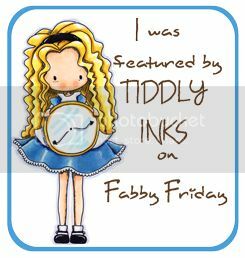 It's Monday and time for Rubbernecker Stamps DT #1 to bring you our makes for this week. I am up first with two stamps: "Here in the South" and "Stylized Martini Glass". I love this sentiment. My family is from the south and I can attest this is true. But it may be more of a case of not being able to control the crazy family as opposed to parading them on the front porch. lol!!! All of my paper is from the Stampin' Up Cupcakes and Carousels collection. I used the Stampin' Write markers in "Brights" for my stamps. 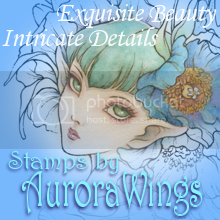 I like being able to individually colour the different parts of the stamps with the markers. It's super easy with the dual tip markers. I used the tag punch from SU too. The little ribbon I used on the tag was white, but I coloured it with the Bermuda Bay marker that I used on the stamps so it would match. The other ribbon is from May Arts. Today is new release day at The East Wind, and today's new image is 'Aurora "Cupcake Fight"'. It's a perfect image for a birthday card. I coloured the image with Copics, and all of my paper and embellishments are from Stampin' Up. 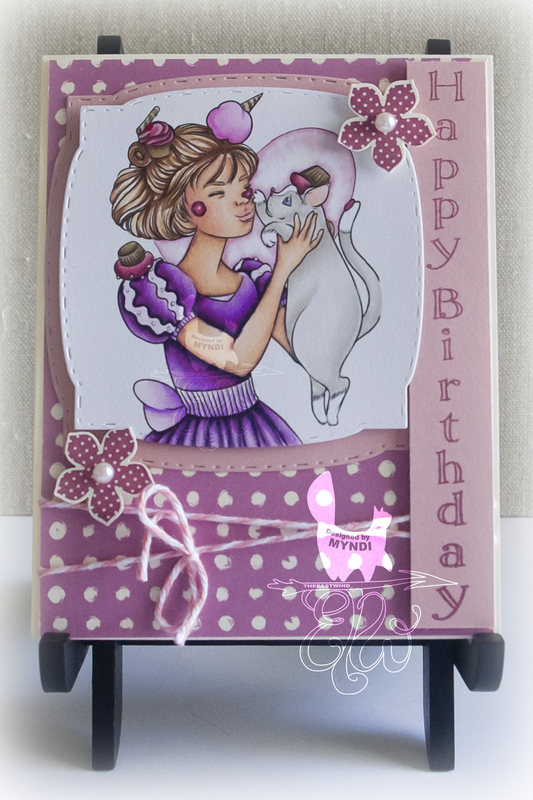 The "Happy Birthday" stamp is from Rubbernecker Stamps. It's Team 1's Sweet Sunday at the Rubbernecker Stamps blog and the DT ladies have created some lovely cards for our team post. I used "Love Birds" and "Just a Word" for my card this week. I used my Stampin' Write markers in Brights from SU to colour the individual parts of the Love Birds stamp. I think this is a really cute stamp and versatile too. You could use it for a wedding, anniversary, Valentine's, or even a birthday card for your better half. 😉 You could use any sentiment you wanted, but I picked "Just a Word" for this one. Most of the paper is from my scrap pile, which is becoming way too big so I have tried to use some of it up with some recent cards. 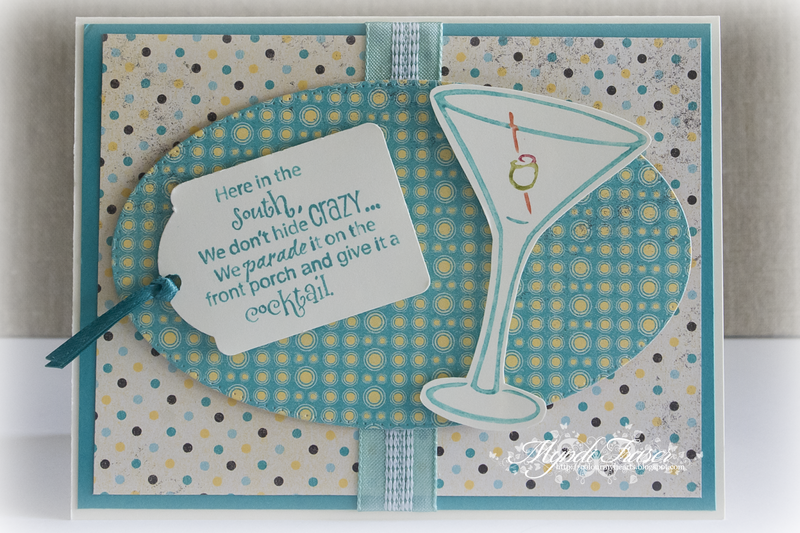 The Sahara Sand paper I used as the base for my stamping is from Stampin' Up. The ribbon is from May Arts. If you haven't stopped by and checked out the new challenge that went live this week, pop over there and check it out now by clicking HERE. The theme is April Showers (April Showers Bring May Flowers). The prizes are a 1st prize $25 gift certificate, and a 2nd prize $15 gift certificate to the Rubbernecker store. Happy Monday! It's time for a new Rubbernecker Stamps card and the beginning of Team 1's week, including a new challenge starting on Tuesday. 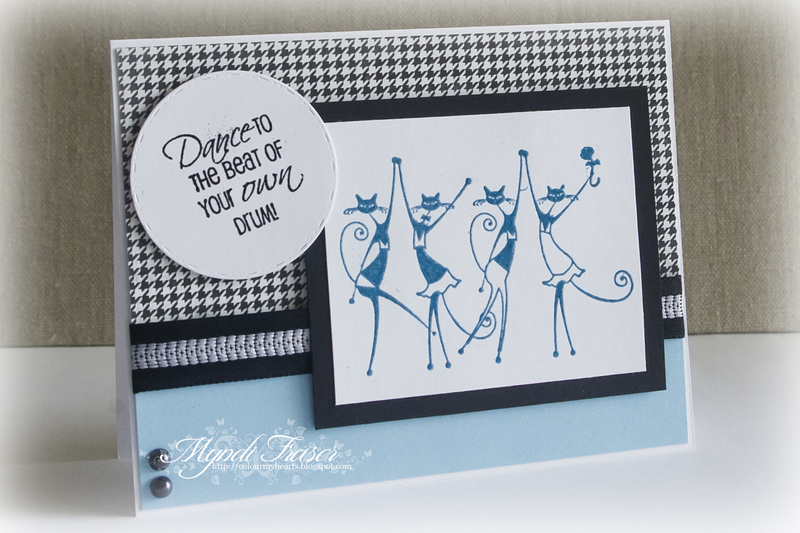 Today I have used "Dancing Cats" and "Your Own Drum" for today's card. I heat embossed the cats and used a sapphire blue embossing powder. All of the paper I used is from my scrap stash. The blue paper is iridescent but you can't see the shimmer in the picture. The ribbon is from May Arts. Tuesday, April 11 is the beginning of a new challenge on the BLOG. Head over there and see what the new challenge theme is and enter your creation for a chance to win either a $25 or $15 gift certificate to the store. There are some amazing new stamps and die sets in the STORE, and they're going fast! 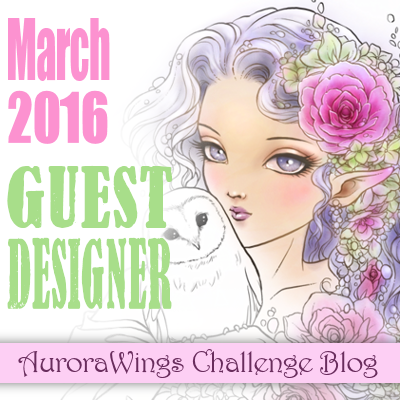 It is time for a new challenge at Aurora Wings and the theme is "Easter Pastels". I used the new "Spring Sprite" from last week's new showcase release for my card. I coloured the image with Copics. I tried to keep my colours light while still giving some depth to the image. My flowers and other embellies are all from Live & Love Crafts, except for the butterflies which are a Martha Stewart punch. 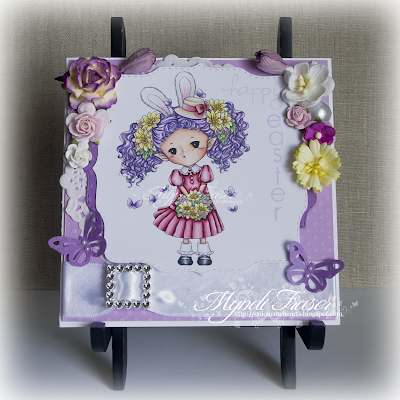 My "happy easter" stamp is from Stampin' Up. 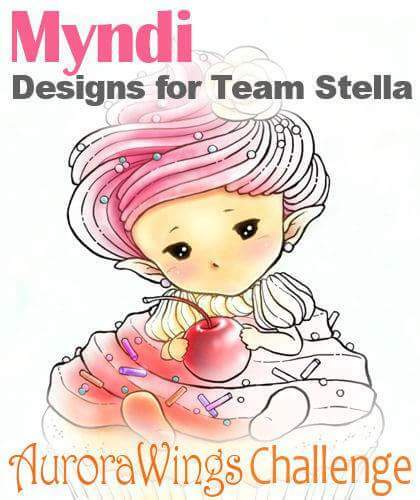 Please make sure you stop by the challenge blog for some other beautiful inspiration from my Stella DT sisters. There are some seriously beautiful creations there this month, as there are EVERY month! 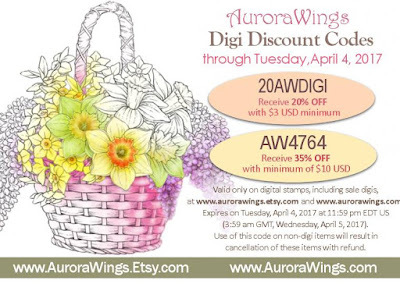 There will be 1 (one) Artist's Choice Award Winner to be selected from entries using Aurora Wings digis ($20 GC and Badge); 1 (one) Random Winner ($20 GC); Top 3 Winners to be chosen by the DT ($10 GC and Badge). The challenge rules can be found HERE. Here are some coupon codes that are good through April 4, in case you're in the mood to go shopping. Links to the stores are below. For Team 1's Sweet Sunday post I used the new Build a Garden stamp and coordinating die sets. The paper is from Stampin' Up. I love these new sets that you can stamp and build and layer. The dies are very high quality and they are a lot of fun. A new challenge is up and running on the BLOG so go and check it out. The theme is "Easter" so you have no excuse to not join in. I KNOW you have someone to make an Easter card for! 😉 The prizes are a $25 and a $15 gift certificate so don't pass up that opportunity! Head over to the STORE and see what you can find to make that card with!